Home » Personal Finance » How to Lock Unlock Aadhaar Card Online? Aadhaar card is becoming mandatory document throughout. Any compromise in Aadhaar Information may lead to possible misuse or fraud. In order to prevent any potential misuse, you can Lock your Aadhaar Card Online. The mechanism of locking and unlocking Aadhaar is provided by UIDA. This feature will lock biometric information of card holder. Biometric information refers to the iris, finger prints, and facial photograph. This information is used for authentication purpose. Once you Lock Aadhaar biometrics data it cannot be used for authentication by anyone. In order to make use of biometric data you need to unlock it. The unlock biometric information can be used for temporary period of 10 minutes. This information will be locked once again automatically. You must be thinking why I should lock my Aadhaar Card? Why to Lock Aadhaar Card? e-KYC Biometric – Nowadays Aadhaar is used for e-kyc based biometric transactions. It is used at Opening of Saving bank account, getting a new mobile connection etc. Let us say you want to open bank account where KYC is mandatory requirement. Bank representative is using Aaddhar Based Authentication system, where you need to authenticate yourself using fingerprint. If your biometric data are compromised, then somebody can use misuse this data for identity theft and KYC approval. Loss of Aadhaar Card – Suppose your Aadhaar card is stolen or loss. Lost Aadhaar card can be misused for doing e-payment or e-KYC. If your Aadhaar Biometric information is locked you need not to worry about any fraud or misuse. 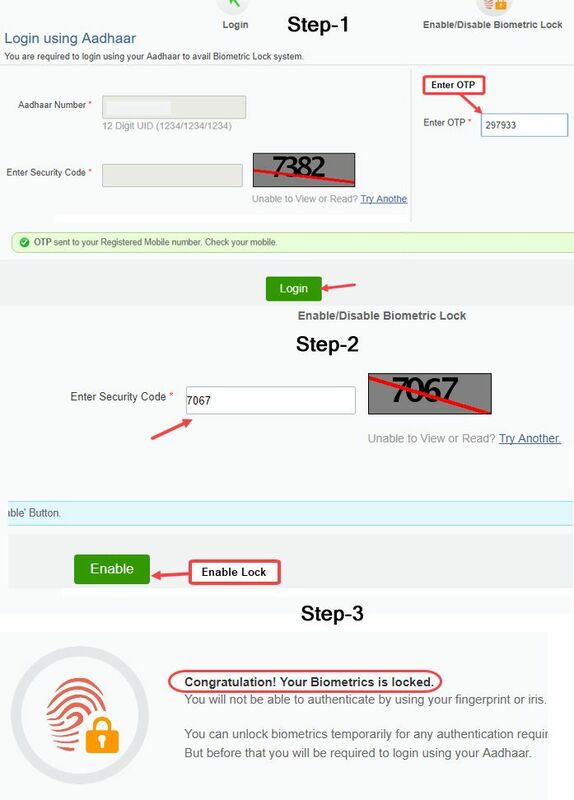 The process to Lock and Unlock Aadhaar Biometric is given below. Visit LOCK UNLOCK Biometrics link of UDAI website. Type your Aadhar Card Number. Type the Security Code. Click on “Send OTP” button. Now, you will receive OTP on your registered mobile number. Fill it in Enter OTP field and click on “Login” button. Enter Security Code and Click on “Enable” button to Lock Aadhaar. Step 3. If you see a success message on the screen then you are done. Your Aadhar card bio metric details are locked now. How to Unlock Aadhaar Card Online? 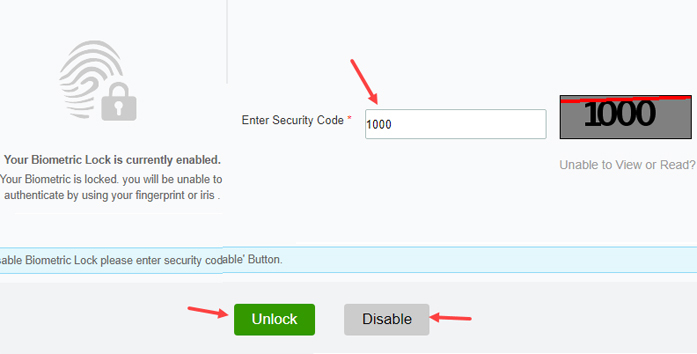 After login you have two options (1) Unlock (2) Disable. Enter Security Code and Click on Unlock to Unlock Aadhaar. Locking and unlocking Aadhaar Card can be done online only. This facility is not available offline. Your mobile number must be linked with your Aadhaar in order to avail this facility. Because UDAI will send a one-time password to your registered number. Once you lock Aadhaar, then you can unlock it only for 10 minutes. Hope above step by step guide will help you in securing your Aadhaar.